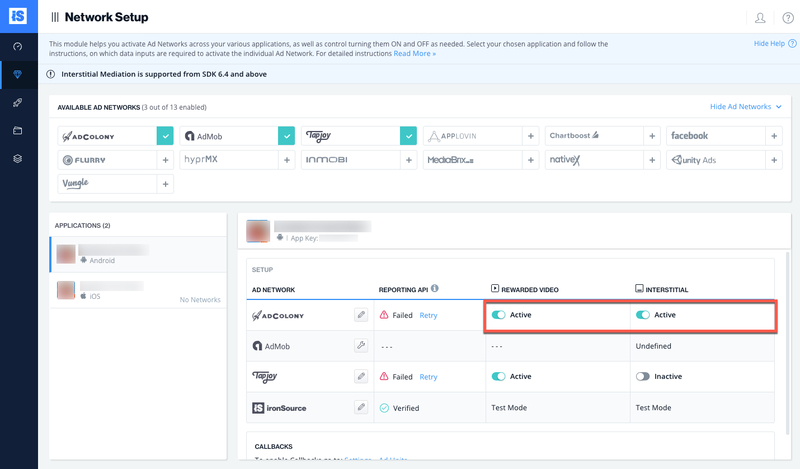 This guide instructs you step-by-step on how to set AdColony live as an Ad Network on the ironSource Mediation platform. Create an account with AdColony. You can do so here. 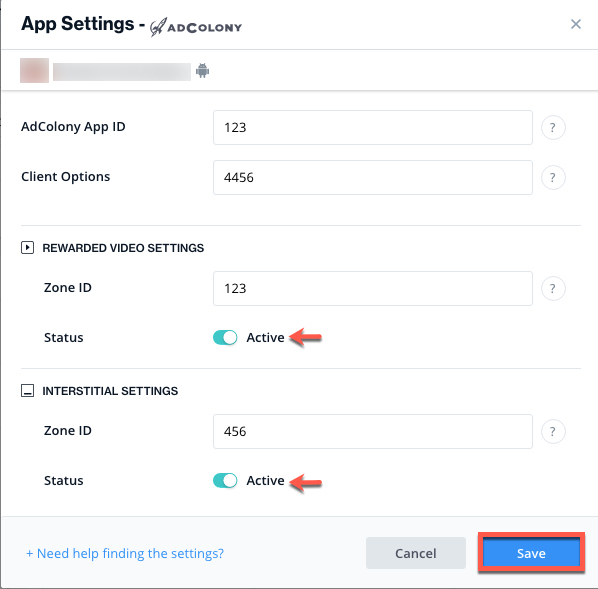 To gain access to AdColony’s inventory within ironSource’s Mediation platform, you must first add your app and set up Ad Zones in your AdColony account. 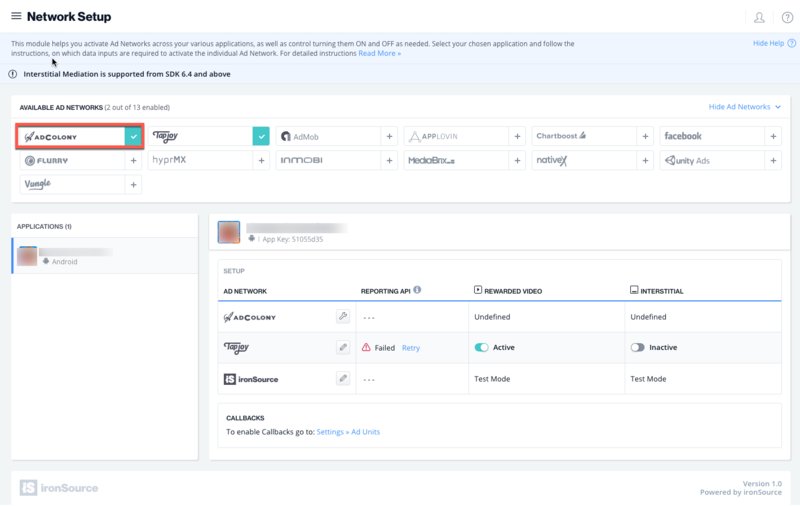 App URL – Add the AppStore or Google Play URL of your application. If your app is not live yet, you can also enter a temporary name manually. COPPA – Select if your app is targeted to users under the age of 13 for COPPA compliancy. Ad Settings – You can customize which Ad Categories you want to utilize.Once you’ve entered all your information, select ‘Create’ to finish. Note: You will need a unique AdColony application per platform (iOS + Android), just the same as in your ironSource account. 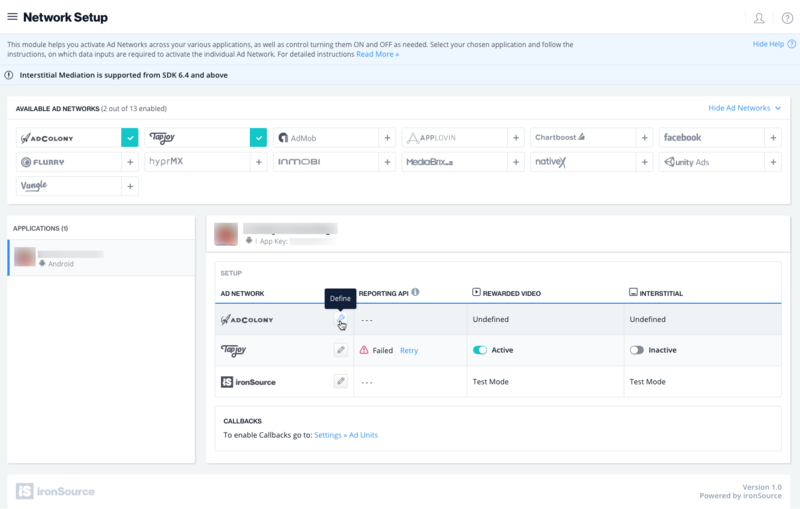 Once your application has been added, you can create an Ad Zone. In AdColony’s system Ad Zones are Placements to which AdColony delivers ads. This will be the placement in your app where you have configured the ironSource Rewarded Video or Interstitial to trigger. App ID This is the unique identifier of your application in AdColony’s system. Zone ID This is the unique zone which AdColony will deliver ads to. 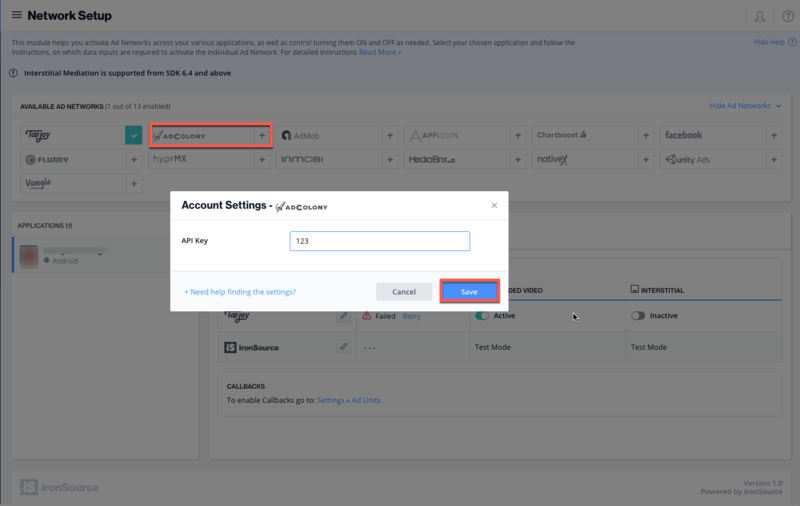 Read-Only API Key This is a unique identifier for your AdColony account, which allows the ironSource Mediation Platform to import performance data from your AdColony account to use in reporting & optimization. Client Options (Android Apps Only) This is a string to declare your App Version and App Store so AdColony may optimize according to this data. Once you obtain this information, you must configure AdColony’s Parameters in your ironSource Account. By adding the above information correctly, you will be able to take full advantage of AdColony’s ad inventory and reporting data on the ironSource Mediation platform. Navigate back to the ‘Apps‘ tab and you will locate the ‘AdColony App ID‘. Navigate to ‘Monetization’ ➣ Select the ‘App’ you created ➣ Then select the ‘Zone‘ you created and you will be directed to the below page, where you will find the ‘Zone ID‘. Select the Drop-down menu on the top right of their dashboard, and you will find the ‘Account Settings’ link. On the settings page you will find the ‘Read-Only API Key’. Select AdColony from the list of Available Ad Networks and enter the AdColony ‘API Key‘. Click ‘Save‘. 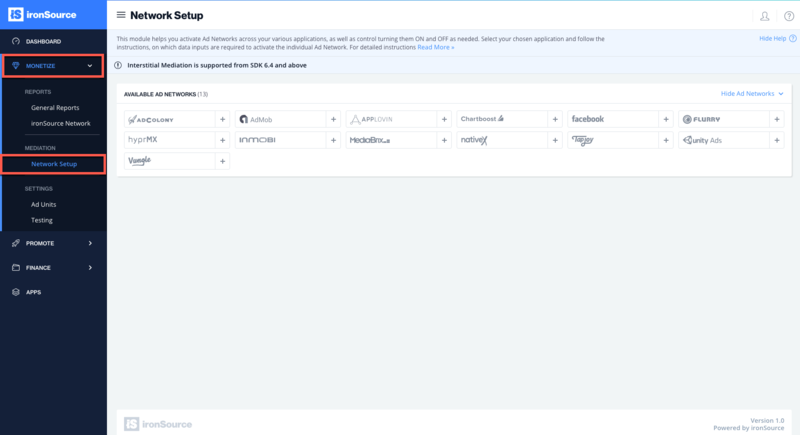 AdColony will then be enabled in the Available Ad Networks table. Make sure to define the app on which you’d like to run ironSource’s Mediation with AdColony. Go to the AdColony row on the Setup list of Ad Networks and click on the ‘Define‘ icon. Insert the ‘App ID‘ and the ‘Zone ID‘ for Rewarded Video and/or Interstitial in the relevant fields. Set status to Active and click ‘Save’. You will then see AdColony as Active for Mediation on your Setup Dashboard. Import the IronSourceAdColonyAdapter_[version].unitypackage to your Unity project. You can find the latest AdColony Unity Package here. To add the adapter, simply double click on the IronSourceAdColonyAdapter_[version].unitypackage and add all files to your Unity project. Note: If you are upgrading from a previous version, please remove AdColony.x.x.x.jar from Assets/Plugins/Android/IronSource/libs. Note: If you are upgrading from a previous version, please remove AdColony.x.x.x.framework from Assets/Plugins/iOS/IronSource. You are now all set to deliver AdColony Ads within your application!